We’re always working hard to bring you the best offers and promotions for international calling. Check out our current and recent campaigns. Open a VIP account and get an extra $5 FREE when you open with a balance of $10 or more. We are so convinced that you will love our international call quality and our easy to use smartphone app, VIPConnect® for Android and iPhone, we are giving away a FREE 5 minute call to new customers when you download our app from the Apple App store or Google Play store. Tell your friends and family about VIP and when they open an account, we will thank you with $10 FREE calling credit - Your friend also gets $5 FREE when they join! Just share your referral link on social media or email it your all your friends and family. Join the VIP Mobile Club to receive text messages about special deals and promotions. To join the VIP Mobile Club text ‘JOINVIP’ to 55678. Make sure you have an email on your account and we may randomly select you for our Customer Satisfaction Survey. 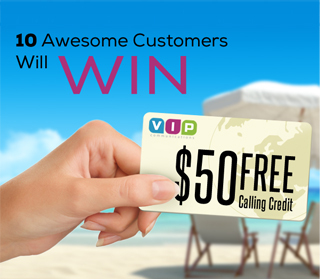 Tell us about our Customer Service and enter to win $50 FREE calling credit! 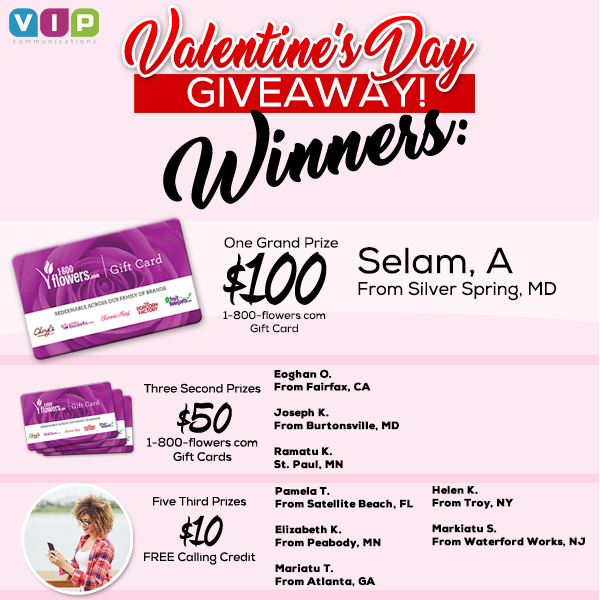 Click here to enter by telling us what you love about VIP. 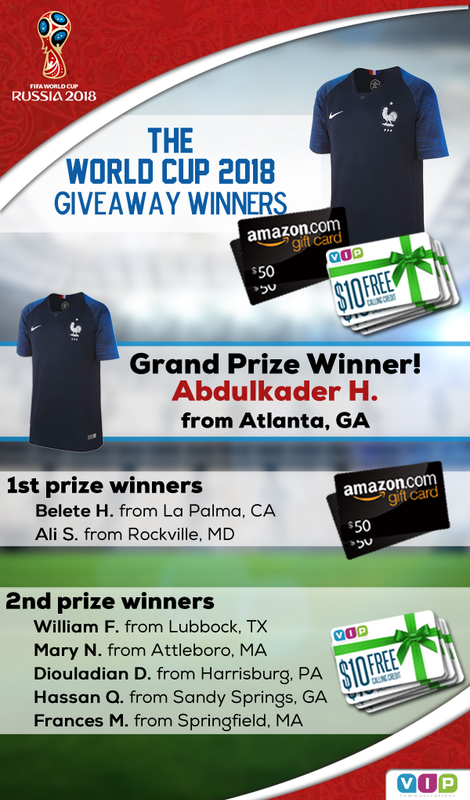 Enter by 7/27/2018 12:00PM EST. Pick the winning team between 6/19/2018 and 7/4/2018 11:59PM EST. Offer valid between 6/14/2018 to 7/15/2018 11:59PM EST. 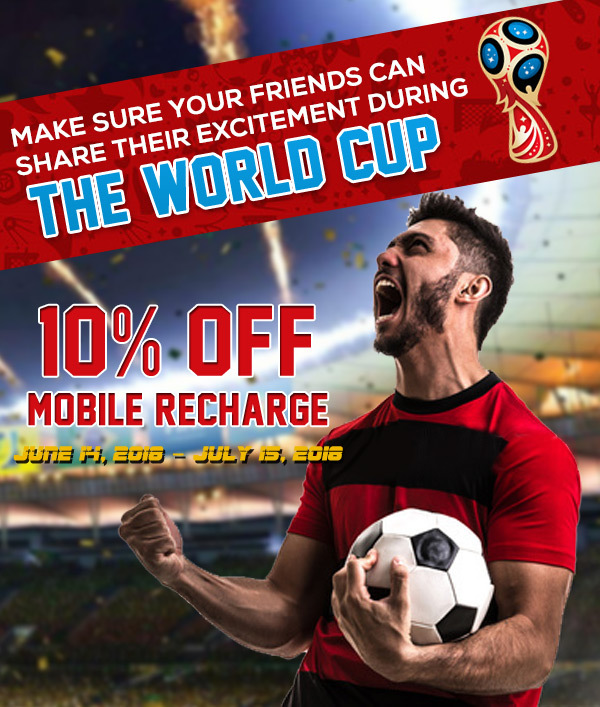 1¢/min OFF is only valid for Nigeria, Morocco, and Senegal for accounts on a standard rate plan from 12:00 am - 11:59 pm ET on each game day during the group stage. Accounts on other special rate plans are not eligible this promotion. The game schedule is listed above. Subscribe for SMS notifications to receive alerts on game day. Make 90 minutes in calls for a chance to win! Entries based on calls made between 1/30/2017 and 2/3/2017 11:59PM EST. 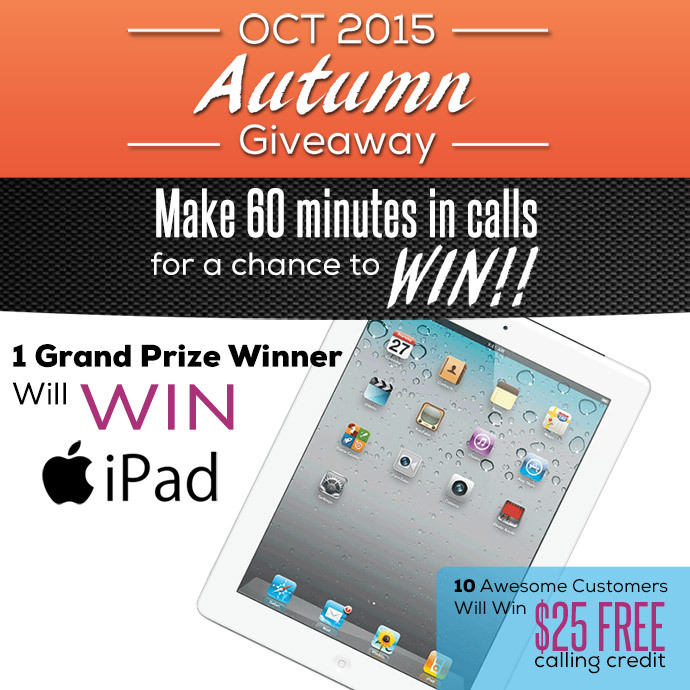 Make 60 minutes in calls for a chance to win! Entries based on calls made between 11/28/2016 and 12/2/2016 11:59PM EST. Each 5 minute increment of calling counts as one entry. For example, a 20 minute call = 4 entries. Entries based on calls made between 08/15/2016 and 08/19/2016 11:59PM EST. Entries based on calls made between 06/13/2016 and 06/17/2016 11:59PM EST. Entries based on calls made between 2/2/2016 and 2/5/2016 11:59PM EST. Entries based on calls made between 1/19/2016 3:00PM EST and 1/22/2016 11:59PM EST. Entries based on calls made between 12/28/2015 and 12/30/2015 11:59PM EST. Entries based on calls made between 12/15/2015 and 12/18/2015 11:59PM EST. 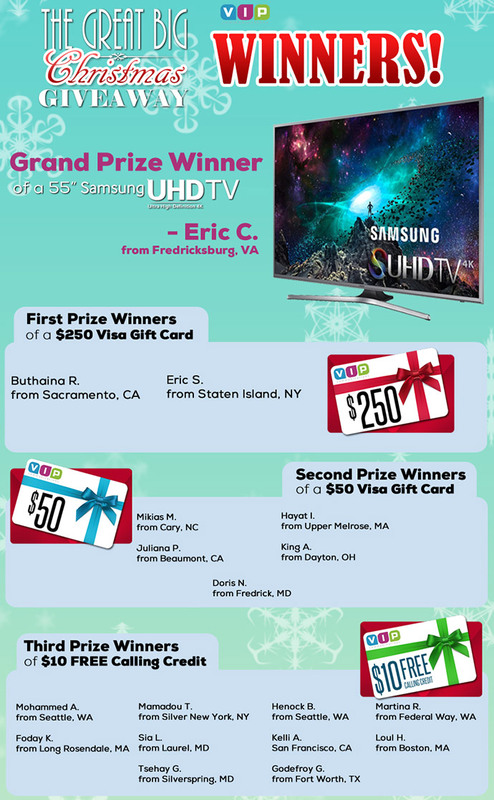 Entries based on calls made between 12/07/2015 3:00PM EST and 12/11/2015 11:59PM EST. 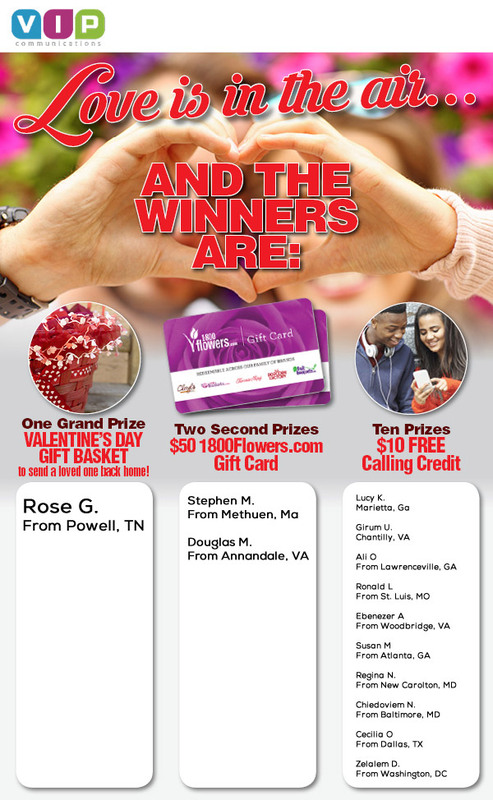 Entries based on calls made between 12/01/2015 3:00PM EST and 12/04/2015 11:59PM EST. Entries based on calls made between 11/24/2015 3:00PM EST and 11/27/2015 11:59PM EST. 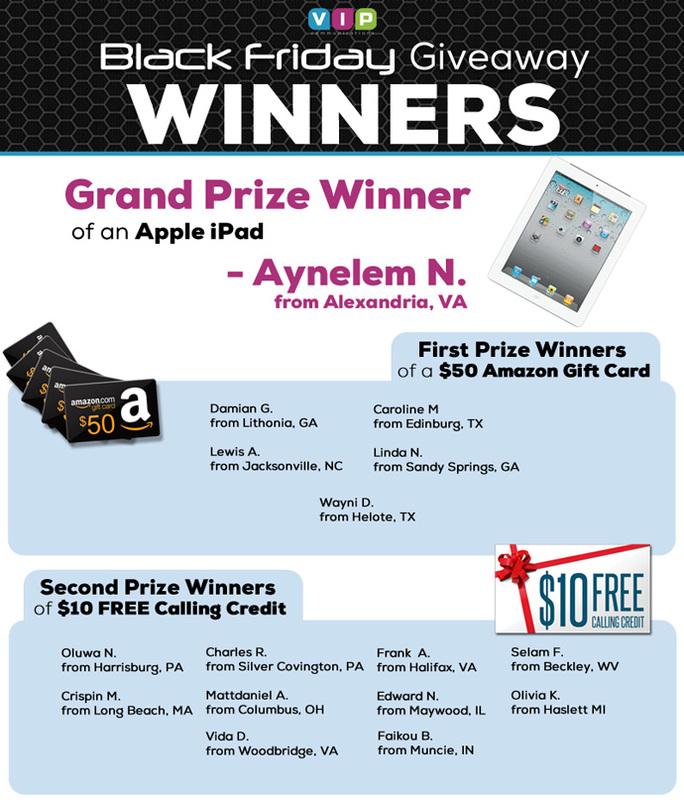 Entries based on calls made between 11/02/2015 3:00PM EST and 11/06/2015 11:59PM EST. Entries based on calls made between 10/13/2015 2:00PM EST and 10/16/2015 11:59PM EST. The more you talk the more chances you have to win! 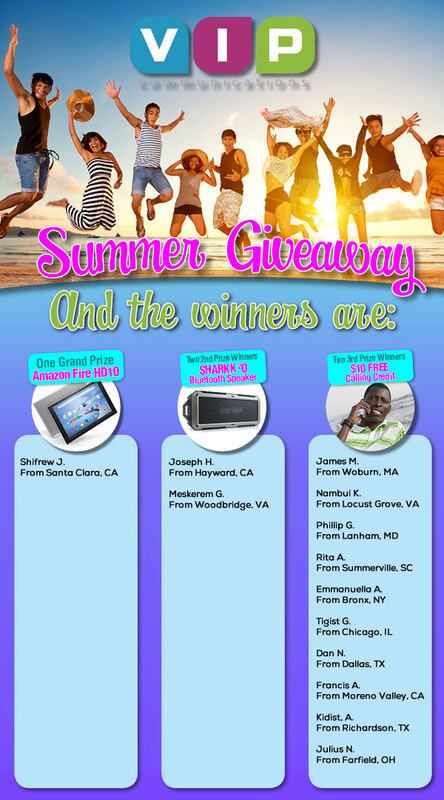 Entries based on the total duration of calls made between 06/01/2015 12:00AM EST and 06/19/2015 11:59PM EST. Calls under 5 minutes in duration will not be considered. The winner will be chosen randomly. For each additional 5 minute increment that you talk, you get another entry in the giveaway. Join the VIP Mobile Club to receive text messages about special deals and promotions. 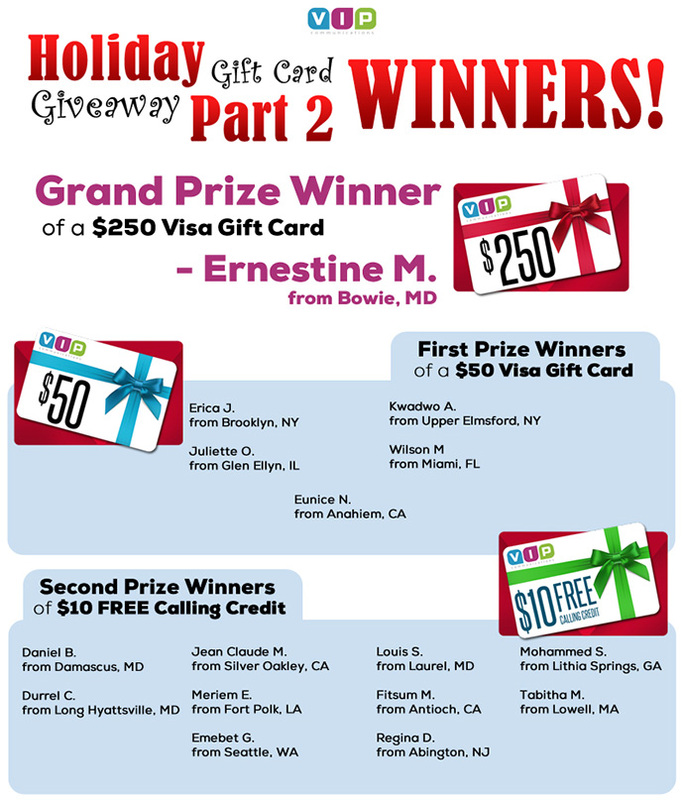 If you join by 01/23/2015 you will be automatically entered to win $50 FREE calling credit. 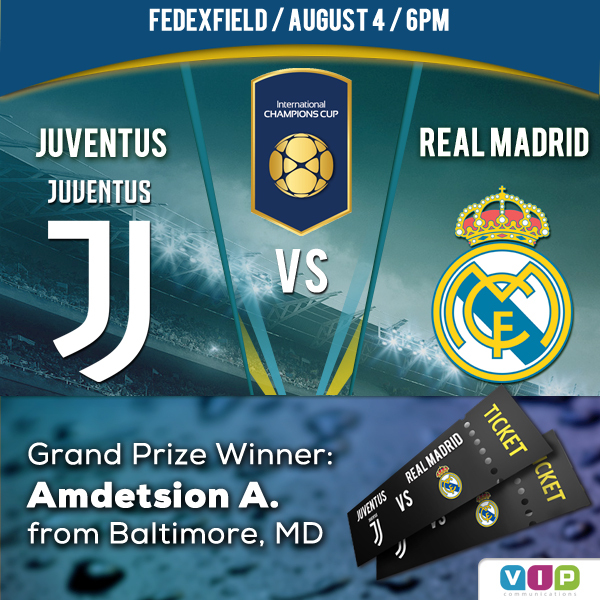 To join the VIP Mobile Club text ‘JOINVIP’ to 55678 or click here. 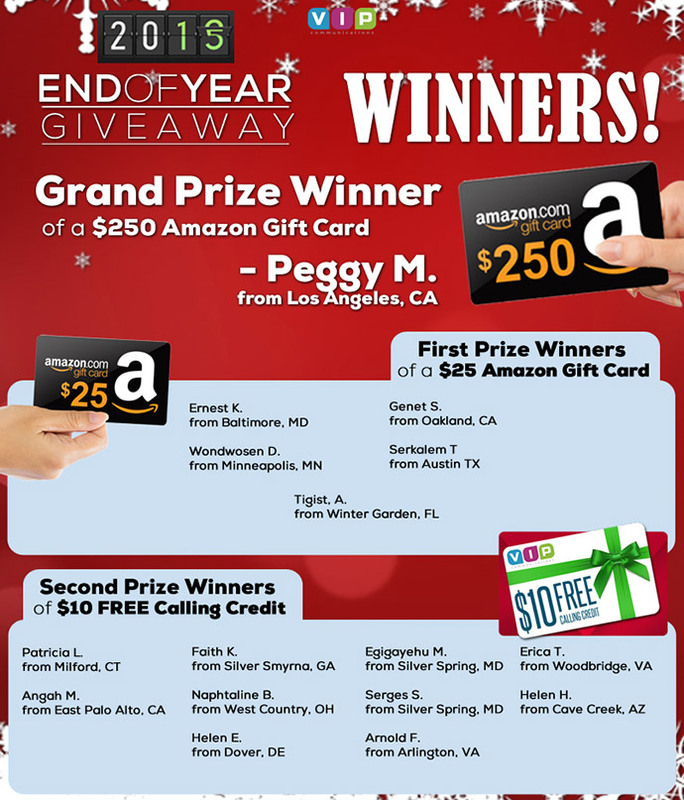 We will announce the winner on our Facebook page on 01/23/2015. Entries based on the total duration of calls made between 11/24/14 at 12am EST and 11/30/14 at 11:59pm EST. Every Monday, we post an image on our timeline and encourage people to share it a certain amount of times in order to win $5 Free Calling Credit. For example, the 10th person to share the image receives free calling credit. It’s a fun and competitive way to engage with VIP and fellow fans! Facebook – VIP Fan of the Week Each Thursday, a customer is randomly chosen as the “VIP Fan of the week” and receives $10 FREE calling credit. The chosen customer is asked what they like best about VIP and/or what VIP service do they like the most. Their answer and profile is featured on our timeline for all of our VIP fans to see. 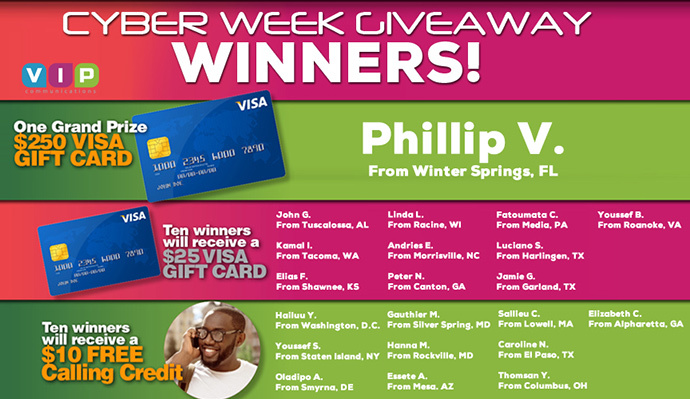 Each Thursday, a customer is randomly chosen as the “VIP Fan of the week” and receives $10 FREE calling credit. The chosen customer is asked what they like best about VIP and/or what VIP service do they like the most. Their answer and profile is featured on our timeline for all of our VIP fans to see. A random and neutral image is posted and fans engage by can comment with their own creative captions. The caption that has the most likes from fellow VIP fans wins their choice of the following: $20 Amazon gift card $20 Egiftcard online (hosts over 180 online stores to shop from) $25 of VIP Credit to their account. Our office will be closed January 7th, 2014 at 6:00 pm for our annual employee holiday celebration. We apologize for the inconvenience. Try us out online and get 20% FREE calling credit with coupon code HOLIDAY13. Melkam Gena! Get 20% FREE calling credit when you re-credit online for $5 or more with promo code: MELKAMGENA. Happy Holidays! Get 10% FREE calling credit when you re-credit online with coupon code: HAPPYHOLIDAY. 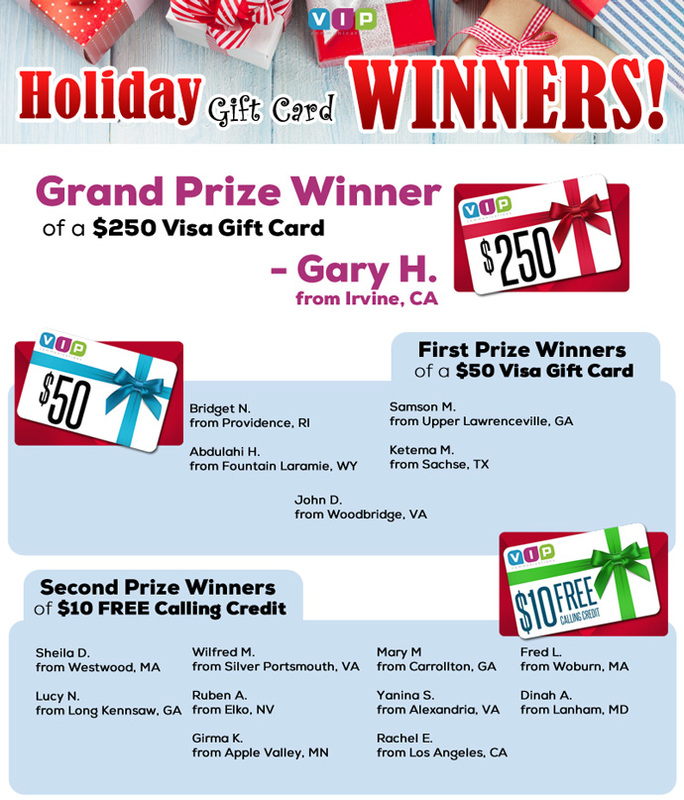 Get special access to the VIP Holiday promotion before anyone else when you like us on Facebook! Customers were asked to post a picture of any location they would like to visit in the world and why. 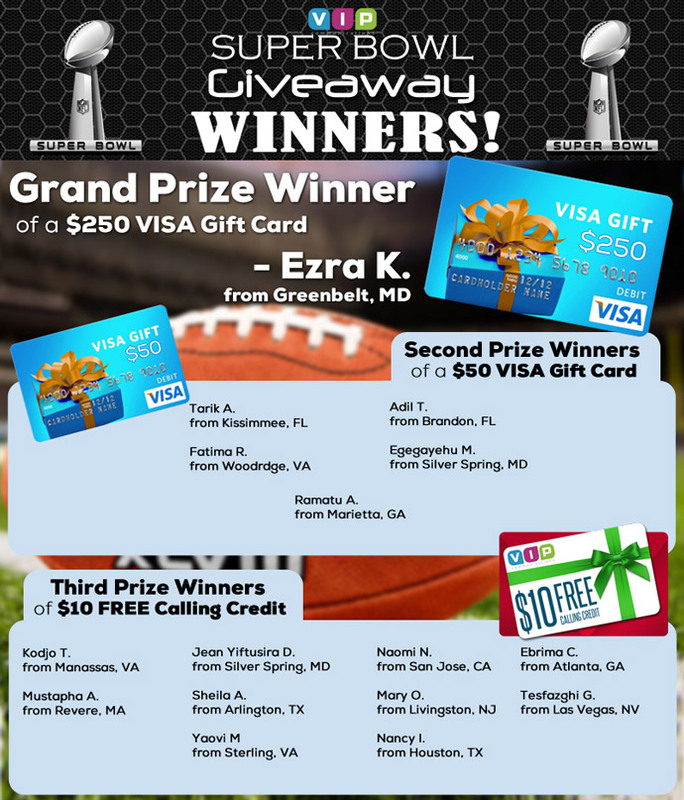 Customers, their friends and family members were then able to make one vote on a daily basis to decide on a winner who received $50 FREE calling credit. For a limited time, top-up your loved ones’ MTN mobile phones in the following countries and we will match your credit for free! Airtime bonus available to these MTN destinations: Liberia (Lonestar), Cameroon, Guinea Conakry, Congo Brazzaville, Nigeria, Ivory Coast. Surprise your family with a mobile credit directly to their phone with Mobile Recharge! Use Mobile Recharge today and we will email you a coupon for $5 FREE calling credit. Happy Eid al Adha! Re-credit for $15 and get 15% FREE Calling Credit with promo code: EID2014. Get over 1 ½ hours of FREE calling credit! Refer a friend and when they try us for $25 or more you get $20 FREE calling credit! If they try us for $10 or more you get $10 FREE calling credit! Your friend will also get $5 FREE. Get over 1 hour of FREE calling credit! Refer a friend and when they try us for $25 or more you get $20 FREE calling credit! If they try us for $10 or more you get $10 FREE calling credit! Your friend will also get $5 FREE. Get over 4 ½ hours of FREE calling credit! Refer a friend and when they try us for $25 or more you get $20 FREE calling credit! If they try us for $10 or more you get $10 FREE calling credit! Your friend will also get $5 FREE. Get over 9 ½ hours of FREE calling credit! Refer a friend and when they try us for $25 or more you get $20 FREE calling credit! If they try us for $10 or more you get $10 FREE calling credit! Your friend will also get $5 FREE. Get over 5 ½ hours of FREE calling credit! Refer a friend and when they try us for $25 or more you get $20 FREE calling credit! If they try us for $10 or more you get $10 FREE calling credit! Your friend will also get $5 FREE. Get over 2 ½ hours of FREE calling credit! Refer a friend and when they try us for $25 or more you get $20 FREE calling credit! If they try us for $10 or more you get $10 FREE calling credit! Your friend will also get $5 FREE. Whether you’re a new customer or simply new to mobile—VIP has great offers and promotions that mean free international calls to some of our most popular countries from the United States. We’ve built close relationships with great companies from all over the world, including many countries throughout Africa, to bring you the best deals and promotions using our free international calls app. In addition to saving you money with our competitively low call rates and low cost international calls, we’re always finding new ways to help you save. 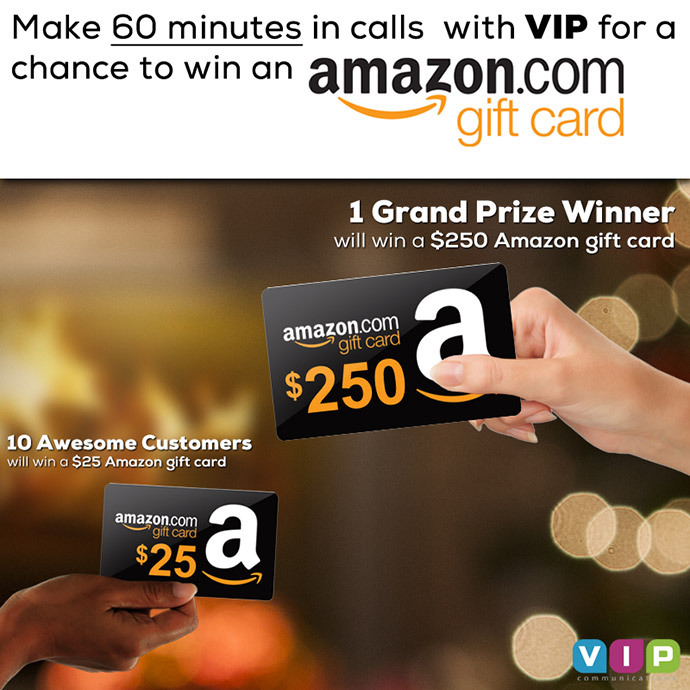 From free international calls from mobile devices, to amazing referral bonuses, holiday specials, Facebook contests and more, VIP communications brings you tons of ways to save money while staying connected to the important people in your life. Get credit for international free calls by simply referring a friend—or just by signing up! With just a few easy steps to sign up, you’ll quickly be able to try out VIP with free international calls from mobile or landline phones. You’ll also get free credits that you can use to make free international calls by inviting a friend or family member to join. The more referrals you make, the more you save. If you have family or friends living abroad, especially in countries throughout Africa, VIP communications helps you stay in touch with them more often for less money. Our free international calls are available for all countries around the world and we often bring you special promotions and offers to save even more when calling select countries. You’ll also benefit from our frequent holiday promotions, customer contests and Facebook specials that will help you save tons of money when calling abroad. At VIP Communications we’ve been helping customers to save on international calls for 20 years. With our free and low cost international calls, we not only save you money, you also benefit from tremendous customer service and technical expertise, including live support. We pride ourselves on offering our customers the very best service and rates, so that they can rely on us to stay connected to all of the special people in their lives around the globe. We go above and beyond other calling plans to bring you the very best free international calls app and amazing promotions. You’ll be able to make all of the calls that you want, while saving lots of money in the process. Whether you’re calling Burkina Faso, South Africa, or almost anywhere else on the planet, VIP has great offers and promotions that help you make cheap international calls. Want to take advantage of credit for free calls on the go? Download our VIPConnect App for iPhone or Android and save even more. Take advantage of our many offers and promotions and join the VIP family today.